Dan Burridge, head chef at Hart’s Nottingham shares his tips to help you prepare the perfect roasties. Choose the right potato. Maris Piper is a good; it has a good flavour and its texture means it dries out well and the inside fluffs nicely when cooked. Peel and cut the potatoes. Don’t cut them too small and make sure they are consistent. The larger they are the fluffier the potato you will have in the middle once they are cooked. Place in a pan of cold, salted water and bring to the boil. Don’t boil them too rapidly, simmer for around 15 minutes until they are almost cooked. Add oil to a trusted tray and place in the oven. Choose a tray that isn’t going to stick and make sure its big enough to take all your potatoes comfortably – or use a couple. The heat needs to be able to circulate around each potato as this is what makes them crispy. Use a good quality olive oil and allow around a tablespoonful of oil per potato. Strain and leave to steam dry. Leave for around 10 minutes and then shake gently to rough up the outsides. This allows the outside to act like a sponge and soak up the fat, making them crispy. Carefully place the potatoes into the hot tray and turn gently to coat with the hot oil. Return to the oven. Be patient. 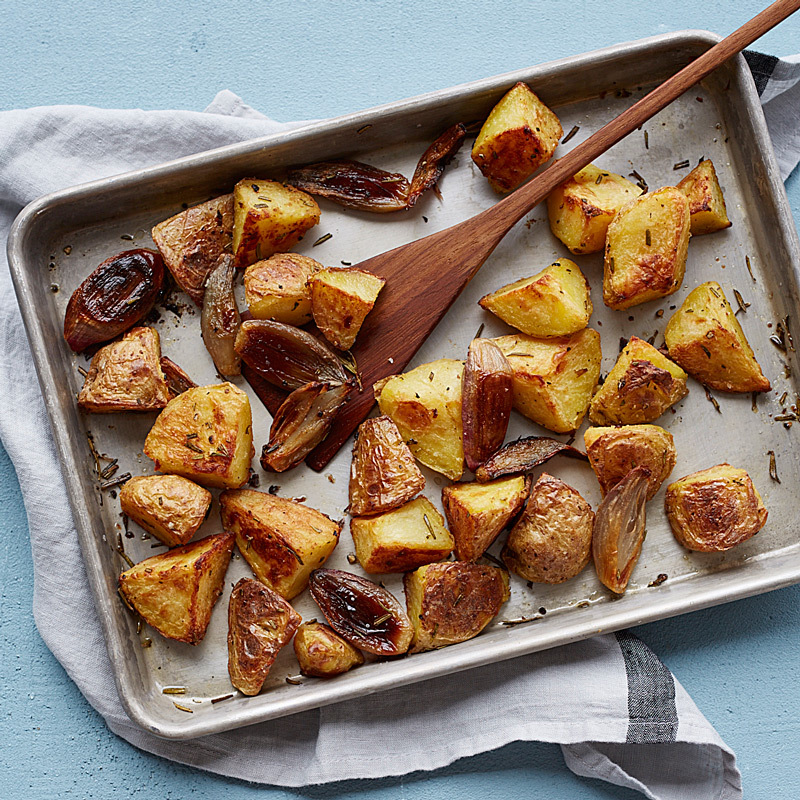 Good roast potatoes will take at least an hour at 175°C. Avoid moving the potatoes for the first 20 minutes and then baste gently with the fat from the tray. Resist the temptation to shake the tray as this will break the potatoes up. Continue to baste or turn every 20 minutes. After about 40 minutes scatter Malden sea salt, sprigs of thyme and a few unpeeled garlic cloves* over the potatoes, stir gently and return to the oven for a further 20-30 minutes or until golden and crispy. *Choose the accompaniment depending of what else you’re cooking. Thyme is excellent with chicken or turkey, if you are having goose then try orange peel, star anise, cinnamon sticks and perhaps a touch of mixed spice to make them more interesting. Read also Traditional Sunday Roast blog. So if you don’t fancy cooking come and join us at Hart’s Nottingham. Call 0115 988 1900 or book easily online here.